My 4-year-old daughter treats every day as a special occasion. She won't leave the house in anything less than a fancy dress and the perfect accessories: not one, but two big bow headbands, a homemade bead bracelet, a magic wand, sunglasses, sequined sandals and pretend make-up that she applies to her eyelids, cheeks and lips with an ultra quick wave of her little fingers across her visage. She has sophistication to spare and she loves anything that has to do with dressing up. So when I discovered 100%Gumdrop's necklaces for girls, I knew they would make the perfect gift for her. 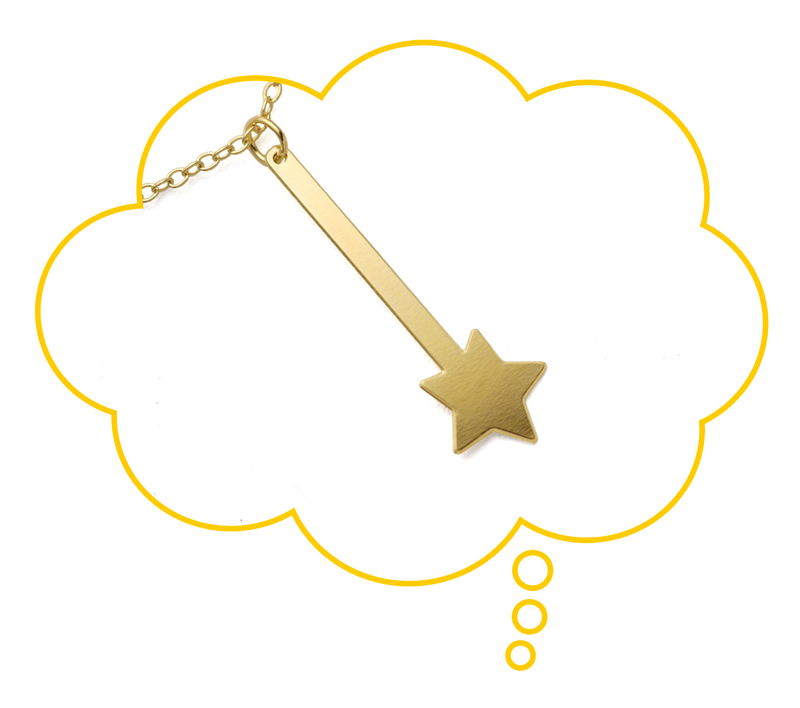 The magic wand necklace is especially illustrative of her wondrous spirit, and I'm sure any little girl would be thrilled to wear this dainty yet powerful trinket. While the wand charm is a special edition necklace, the rest of 100%Gumdrop' nontoxic, lead free jewelry collection features witty wordplay that befits bold personalities with subtlety and charm -- and it beautifully fills the gap in the market for responsibly crafted, affordable jewelry for girls. All 100%Gumdrop necklaces are designed in downtown New York City and manufactured entirely in the USA in Massachusetts and Rhode Island. Comprised of sterling silver, stainless steel, and dipped in 14K gold, the 100%Gumdrop collection is entirely lead free, and CPSIA certified — meaning they use only the highest quality pure metals. 100%Gumdrop was created by mother of two girls, graphic designer and Manhattanite Sarah Litt Cole. Cole formally forayed into accessory design when she was in sixth grade as she waited in line at Henri Bendel’s Open See in NYC with her grandfather, with the hopes that they would accept her offer to sell “the world’s most awesome handmade braided ribbon barrettes” that she had made. Her collection sold out in three days. The 100%Gumdrop collection offers the quintessential necklace for every girl from tot to teenager. There are five styles of necklaces: Flip Flop, Daisy Chain, Word Up!, Birthday and Alphabet. The cheeky Flip Flop collection features two opposing words which may be worn on either side, on one chain. Of the many Flip Flop combinations, two of the most popular are: I love you/Go Away, and Angel/Devil. The Daisy Chain collection contains five words on one chain; so all of your daughter’s nicknames or favorite desserts can be on display in the Nicknames or Sweets necklace: Sweetpea, Peanut, Cupcake, Jellybean, Pumpkin. The Word Up! collection is comprised of one word necklaces that say it all in varying styles of typefaces that playfully relay the sentiment behind the word: wish, love, rockstar, happy, awesome… and more. The Birthday collection is so perfect for kids who have eagerly anticipated turning the ripe old age of 2-12 and are available as a numeral or the number spelled out. You may also opt for the simple yet powerful charm of your child’s initial in the Alphabet collection. All 100%Gumdrop necklaces are designed in downtown New York City and manufactured entirely in the USA in Massachusetts and Rhode Island. Comprised of sterling silver, stainless steel, and dipped in 14K gold, the 100%Gumdrop collection is entirely lead free, and CPSIA certified -- meaning they use only the highest quality pure metals. 100%Gumdrop was created by mother of two girls, graphic designer and Manhattanite Sarah Litt Cole. Cole formally forayed into accessory design when she was in sixth grade as she waited in line at Henri Bendel's Open See in NYC with her grandfather, with the hopes that they would accept her offer to sell "the world’s most awesome handmade braided ribbon barrettes" that she had made. Her collection sold out in three days. The 100%Gumdrop collection offers the quintessential necklace for every girl from tot to teenager. There are five styles of necklaces: Flip Flop, Daisy Chain, Word Up!, Birthday and Alphabet. The cheeky Flip Flop collection features two opposing words which may be worn on either side, on one chain. Of the many Flip Flop combinations, two of the most popular are: I love you/Go Away, and Angel/Devil. The Daisy Chain collection contains five words on one chain; so all of your daughter's nicknames or favorite desserts can be on display in the Nicknames or Sweets necklace: Sweetpea, Peanut, Cupcake, Jellybean, Pumpkin. The Word Up! collection is comprised of one word necklaces that say it all in varying styles of typefaces that playfully relay the sentiment behind the word: wish, love, rockstar, happy, awesome... and more. The Birthday collection is so perfect for kids who have eagerly anticipated turning the ripe old age of 2-12 and are available as a numeral or the number spelled out. You may also opt for the simple yet powerful charm of your child's initial in the Alphabet collection.